Is the forthcoming general election a cakewalk or contest for the ruling Bharatiya Janata Party (BJP) led by Prime Minister Narendra Modi? With an objective of unseating the Modi government several alliances have come up in different states across India. At regular intervals Prime Minister Narendra Modi has dismissed the Mahagatbandhan or grand alliance as a grouping that offers nothing more than corruption, negativity and instability. For more than four decades, political parties defying ideological barriers have formed alliances to unseat a government. This is not the first time that the opposition parties are coming together against the ruling government. The national emergency imposed by then Prime Minister Indira Gandhi in 1975 led to atrocities across the country and the arrest of several political opponents and civil right activists. Two years later a grand coalition took shape in 1977 when the movement against the Emergency galvanized. The coalition of various anti-Congress (I) factions won 345 out of 542 seats, winning 51.89 pc of the popular votes. Congress’s vote-share was reduced to below 35 pc and 154 seats. Since then, this political experiment has become a tool not only to test the index of opposition unity, but also to unseat a well-entrenched ruling party in power. The next time opposition parties came together was in 1989 under the leadership of VP Singh who formed a rainbow coalition to unseat the Rajiv Gandhi-led Congress government. 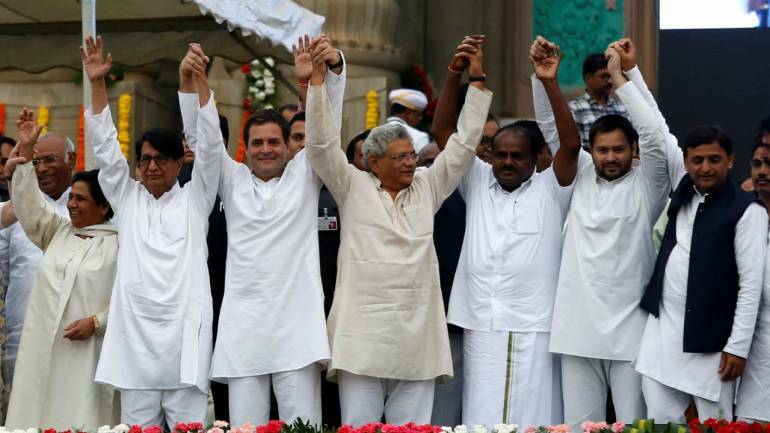 Entangled in allegations of kickbacks in the purchase of Bofors Howitzer from Sweden, Congress bore the brunt of the anti-incumbency wave, and VP Singh led the National Front (a coalition between Janata Dal, Telugu Desam, Dravida Munnetra Kazhagam of Tamil Nadu, and Asom Gana Parishad of Assam and Indian Congress (Socialist)) to form government, with outside support from the Left Front and BJP. The Janata Dal won 143 seats with a 40.7 pc vote share, Left parties secured 45 seats with 9.1 pc vote share and the BJP improved its tally to secure 85 seats with 11.36 pc vote share, up from two seats in the 8th Lok Sabha. Congress was reduced to 197 seats securing 39.5 pc vote share as against 415 seats and 48.1 pc in the 1984 general election in the aftermath of Prime Minister Indira Gandhi’s assassination. The United Progressive Alliance (UPA) headed by Congress president Sonia Gandhi brought opposition parties together to deny a second term to BJP-led NDA of Prime Minister Atal Behari Vajpayee. It won 335 seats securing 61.7 pc vote share against the NDA government as the country reeled under acute rural distress. NDA was down to 182 seats securing 23.75 pc vote share. Ahead of the 2019 Lok Sabha elections, opposition parties are also coming together to oust the Modi-led BJP government. Their unity on issues concerning the Modi government, have managed to put the government on a back foot. Be it cornering the Centre on anti-farmer, anti-poor policies and jobless growth, or on bank scams, communal polarisation and the Rafale deal, the Opposition has struck common ground. Though national, the alliance has several sub-components at multiple levels. This could turn the electoral arithmetic and social chemistry against the ruling BJP. For instance a grand alliance has come up in Uttar Pradesh. With the largest number of Lok Sabha seats in this grand political akhara (gymnasium) of Indian politics, where the BJP won 71 seats on its own, is set to face its stiffest political test. This is because arch-rivals Samajwadi Party (SP) and Bahujan Samaj Party (BSP) have joined hands to ensure its defeat. This alliance was tested during the Lok Sabha by-elections last year in Gorakhpur, Phulpur and later at Kairana and the result was stunning; the electorate showed BJP the door. The alliance has also sparked off a new social chemistry among traditional supporters of these political parties. It brings powerful social groups — Yadavs, Jatavs and the Muslims on one side. Add to this alliance outfits like the Sanjay Nishad-founded Nirbal Indian Shoshit Hamara Aam Dal. This party works for the empowerment of Nishad, Kewats, Binds and other backward communities, whose traditional occupations centre on rivers, such as boatmen or fishermen. Outside this alliance is the Congress. It is also likely to harm and hurt the ruling BJP, as the party could split the upper caste and Brahmin vote. It is instructive to remember that the Congress had won 22 seats way back in the 2009 Lok Sabha poll. In the 2014 election, the Congress’s vote-share was 7.5 pc. The alliance, set to at least half the BJP tally in UP, is no doubt giving sleepless nights to the saffron party. Anti-BJP or the anti-Modi alliance are caught in twin objectives of not just ensuring their own victory in their respective strongholds, but also to keep the Modi- headed BJP out of the sweepstakes. Of course, it is a different story as to why, a strong pre-poll alliance of non-BJP parties have not emerged at the national level so far? Now it is to be seen how Modi and his team are able to influence voters by going all out on the decision of the government to attack terror camps to its advantage in the poll campaign over the next two months.